THIS IS THE 2018 COURSE! IF GOOGLE GOT YOUR HERE 2019 HAS CHANGED. 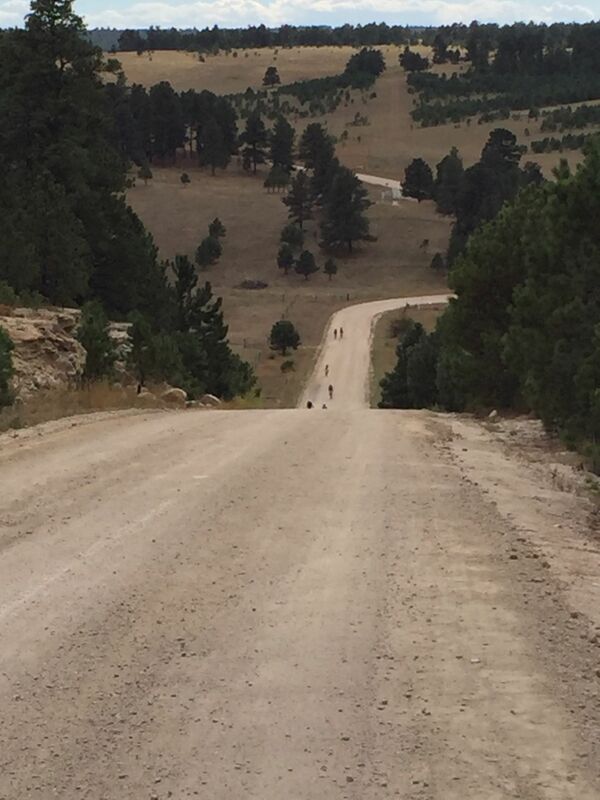 We encourage riders, clubs, and teams statewide to come ride the High Plains Grinder. Represent Colorado, and challenge yourself, your friends, teammates, and fellow cyclists on unpaved country roads to help a great cause. Sign up today! It’s not the hardest course you’ll ever do, but a challenging fun course to spin the legs, pedal at a conversation pace, or hammer it for the satisfaction of beating others to the finish line! Starting in the town of Elbert and head south down the the main front dirt street of Eccles, then hangs a right on Wabash, and then left on Broadway to hook up with the West Kiowa Creek Road which meanders southwest where the course turns left on CR 82 to cruise over the first rolling hills of the day. BE SAFE. CR 82 crosses over pavement at the Elbert Hwy so follow the rules of the road!! Be looking both ways as this can be dangerous at times with horse trailers, hay hauling rigs, and over weight multi-axels tearing up the asphalt — as anyone who has ridden the Elephant Rock Century or has been out this way putting in miles on a road bike can attest — drivers along this stretch of road wear lead boots. So take care and be aware at this crossing. From this fast crossing continue east on CR 82 and head for the short but steep CR 35 Popper riding north. At the top this road it jogs east where CR 82 picks back up again for a short time, when then you’ll hang a left pedaling back north on CR 37. Ride this to CR 94 and then head east again dropping into the historic Bijou Basin via CR 49. This road hooks on to CR 90 continuing east for a short spell where it turns back north on CR 53 for about a mile when it links back to CR 94 riding east. Don’t miss the turn north on CR 69 which will ride right through the old town of Fondis continuing north to CR 102 where it’ll turn west. Stay on CR 102 riding west up-down-and-over more rollers to CR 33 where you will then swing south to CR 98 where the route continues west dropping back down to the town of Elbert which is for the most part at the half-way mark. For riders that want and/or need it once the route drops into Elbert there will be an feedzone with water and some light snacks. Riders can also leave a labeled bag, or as the French say musette to grab on the way on to the second half of the ride. At this point of the ride if you’re unusually knackered, seeing cross-eyed from chasing faster wheels, or have a rapid heart rate because the elevation stole you breath, or maybe your bike’s rear mech is busted and you’re riding a single speed? Then this might be a good place to consider calling it a day. For those in it for the duration it’s here, again, a short crossing over Elbert Hwy. Be cautious and obey the rules of the road and do what mamma told you and look both ways. Proceed onto Garfield Street heading west past the South Forty Saloon and turn right on Main Street in the direction of the Elbert School where the course makes a short but demanding climb that will bend on to CR 98. Ride CR 98 straight west to CR 21 and turn north and proceed to pedal down the hill to CR 106. We will have this marked clearly. Ride due west from here to CR 5 then turn south and cruise past the Ben Kelly Air Park crossing CR 98 to CR 5 which bends to CR 9. Take this to CR 86 and turn west again and ride it to CR 1. Pedal CR 1 south past the Dutch Heritage Garden Center to CR 74 and hang a left riding east again on what is the Elbert County Line. Take this to CR 17/86 and turn north towards the Town of Elbert and you’re just a short 8 miles from completion. Just retrace the road you rode out on following West Kiowa Creek to Broadway hanging a right turn on Wabash and then a left on to Eccles to ride dirt all the way to the finish line. Afterwards we’ll have a podium for 1-2-3 M&W Open + Masters M&W 50+ but we will also want to recognize everyone for participating in our 1st ever High Plains Grinder event!